Portable Space Gard can help you continue to enjoy the benefits of clean air. Includes one media filter. 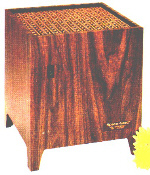 It is recommended to change the media filter annually and more often if there are smokers in the home.